For the past 20 years, Cherry Lodge Cancer Care has responded to the needs of its members and has evolved into an organisation that endeavours to address the often complex requirements of people with cancer. The abiding principle has always been to give them what they want rather than what Cherry Lodge thinks they need. The following strategy document has been drawn up to help us move forward in this three-year period, in terms of service provision, staffing and securing funding. In 1996 a Portakabin in the grounds of Barnet Hospital was made available. This building – called Cherry Lodge – was to be developed into a Centre offering information and support to people throughout their cancer journey, and also to their carers, family and friends. Nursing and administrative staff were recruited, and were joined by the first volunteers. The Centre was officially opened in May 1998 and by the end of 1999 there were 350 members (service users) taking advantage of a range of support that included the library and information service, nurse support, drop-ins, complementary therapies, group activities, seminars and workshops. The charity was renamed Cherry Lodge Cancer Care in 2000, to reflect the fact that our impact extended well beyond the Borough of Barnet. Activity gradually increased and by 2003 we had 1,000 members. The range of services was expanded, with the addition of Befriending (Home Visiting) and an Outreach Nursing Information Service, supported and encouraged by Macmillan Cancer Support. In December 2004 we moved into our current premises, initially as tenants. In February 2009, thanks to a legacy from Beryl and Kirk Howard, we were able to buy the property. This gave us added security and in 2011 allowed us to begin a programme of building work to make the premises better suited to our needs. At the end of 2014, there were more than 2,000 members on our database, including 202 new members enrolled during the year. On average 150-200 people access the Centre every week. Our weekly morning drop-in attracts 20-30 attendees each week and the twice-monthly evening drop-in has approximately 15 members. During 2014, there were 2,454 booked complementary therapy appointments and 1,596 drop-in therapies. Our Outreach Service, at 10 venues, was accessed by 892 people, including 190 carers. In addition to the members, our database includes some 1,500 supporters, both corporate and individual. participates as fully as they choose in all decisions relating to their care and comfort. Cherry Lodge Cancer Care exists to enhance and complement the support offered to people living with cancer, their carers, family and friends, within and around the London Borough of Barnet and South Hertfordshire. Our objective is to provide care and comfort for people on their cancer journey, by providing easy access to specialist information, support and complementary therapies. We aim to improve quality of life, to promote well-being and to encourage a strong resolve for self-help. The service is designed to be person-centred, non-judgemental and available to all in need, on request, completely free of charge. We believe that everyone living with cancer should have easy access to information, support and companionship at all stages of their cancer journey. All our services are offered free of charge and are available to anyone who can visit our Centre (Howard House, 23 Union Street, Barnet) or one of our outreach venues. We help family members and carers as well as people diagnosed with cancer. Our fundamental aims are to improve quality of life, to promote well-being and to encourage a strong resolve for self-help. These ends can be achieved in many different ways, and we have a wide range of services on offer to help meet the individual needs of our members (our name for the people who use our services). At the heart of our services are our two Macmillan Cancer Information Nurses, who meet all prospective members to assess individual needs and concerns and to provide detailed information about the various services on offer. Follow-up appointments are also available. As well as providing medically accurate, up-to-date information on cancer-related topics, our nurses help people to access information from books and the internet. We also stock a wide range of booklets and leaflets for people to take away. Complementary therapies are widely recognised as being very helpful for people affected by cancer, providing symptom relief and fostering well-being. All our therapists are accredited and insured, and members’ therapy programmes are coordinated by our nurses. Therapies currently on offer by appointment include acupuncture, aromatherapy, massage, reflexology and different types of healing. Psychological and emotional support are available one-to-one from our fully qualified counsellors. Drop-in sessions (held weekly on Tuesday mornings and on two Thursday evenings each month) provide an opportunity for people affected by cancer to meet each other, overcome isolation, offer mutual companionship and support, talk to a nurse and receive a short complementary therapy. Hairdressing appointments in the privacy of the Centre are available for people whose hair has been affected by cancer. We also have make-up demonstrations to help boost confidence. Cherry Lodge refers people in need of Advice on Welfare Benefits to the local service provided by Barnet CAB in partnership with Macmillan Cancer Support. Together with the Macmillan Information Specialist at Barnet Hospital, we have pioneered a six-session support course under the title of Facing the Challenge of Change. These sessions provide practical and psychological support to help participants adjust to life soon after treatment. We are currently exploring different ways of meeting this need. We also offer group activities to foster companionship and promote well-being. A Singing Group, an Art Group and three exercise classes (Yoga, Seated Yoga and Chi Gung) all meet weekly. From time to time we also arrange members’ events and outings. There are also support groups for people affected by specific cancers (lymphoma, ovarian cancer, and men’s cancers), a group for young women with cancers of any type, and a carers’ group. All are facilitated by our Macmillan Cancer Information Nurses. Barnet is a large borough with a multicultural population and not everyone finds it easy to get to our Centre. To address the health needs and cancer concerns of people elsewhere in the borough, Cherry Lodge provides a readily accessible Outreach Service with its own specialist nurse holding ‘health and wellness surgeries’ at a variety of community venues. For members who are too ill to attend the Centre, we have a home visiting service manned by trained volunteer befrienders. Our befrienders will generally visit once a week to provide support and companionship as well as some help with light practical tasks. We seek feedback from members on an on-going basis, in order to review the services that Cherry Lodge provides. This can be through face to face contacts, drop-in sessions or more structured questionnaires. The following is a summary of members’ feedback from a questionnaire undertaken in Spring 2015. What do you value about Cherry Lodge? The care and kindness; The fact you are there – always welcoming and reassuring; The community and support; The moral support and good companionship which aids recovery; Friendly atmosphere and support; Friendliness of the staff – easy to get to – variety of therapies; Having the treatments – caring and welcoming staff and volunteers; Companionship, relaxing therapies and cheerful members; Meeting people; Everything! ; All the wonderful staff and people; Helpful people; The welcome – great people who care and take a real interest; The friendship – also friendly and welcoming; Camaraderie and communal atmosphere – various therapies; I enjoy everything CL has offered me as a member; I value all services CL provides – therapy treatments, friendship, compassion, love and support at my most difficult time; General atmosphere of friendliness and acceptance which is always present; The friendly atmosphere in a non clinical setting; The treatments and friendship; Companionship and alternative therapies; Therapies, comradeship and support; Continuing support and alternative therapy. How would you sum up Cherry Lodge? Very positive, helpful and above all the kindness; Caring, sympathetic way I was interviewed after diagnosis and being in the company of others with similar problems; Wonderful and uplifting; Such a boon at this stage for me – just up the road; Helpful and available when you need them; Warm, friendly and caring; Enjoyable, relaxing – a lifeline; Always look forward to visits in such a pleasant atmosphere; Enjoy the therapies and chatting with others; Absolutely wonderful; Wonderful; Have really helped me in the past eight years; A most welcoming, friendly place to drop in and meet wonderful people; I have met many friends – volunteers are helpful and approachable; Since coming to CL have made many new friends and had new experiences; An oasis of love, peace and friendship; Brilliant – you pulled me through at a really bad time; In eight years of treatment I have always had support and advice; Excellent and comforting; First class and very helpful; A place to feel safe and share experiences; Alternative therapies – brought me out of a dark place and offered me support when needed. Trustees considered the feedback at their October 2015 meeting. In response to suggestions relating to healthy eating advice and the services of a nutritionist, it was felt that the best way forward would be to look at engaging a dietitian on a sessional basis to give general advice on healthy eating to groups of members two or three times a year. The suggestion for a healthy eating café will be considered if ever space and the right opportunity arises. Whilst acknowledging that some members would like homeopathic services to be provided, this request will not be taken forward at Cherry Lodge due to the lack of clinical evidence about the effectiveness of homeopathy. Members’ requests for more centres in different areas and for additional drop-in sessions cannot be met at the present time as both of these options would require a significant expansion in staff and volunteers as well as a potentially significant financial outlay for additional premises. There is currently spare capacity at our Thursday evening drop-in sessions and part of our strategy is to continue to develop our outreach services to provide greater access to our information and support services in other areas. Parking is an issue due to borough parking restrictions and this situation is unlikely to change. Our Centre in Union Street is well served by public transport and we are looking at increasing the number of volunteer drivers to establish a transport service to and from the drop-in sessions for those members who have difficulty in attending. The issue of cold and draughts in the reception area was dealt with in spring 2016 by the fitting of a new boiler and secondary double glazing as part of the major renovation work carried out at Howard House. At the same time, the ambience and flexibility of the downstairs area were improved by replacing the wall between the reception area and the Andy Weekes room with soundproof double doors. Cherry Lodge has a programme of fundraising and other social events to which members are invited. There are occasional social events specifically for members and it is our intention to increase this provision. 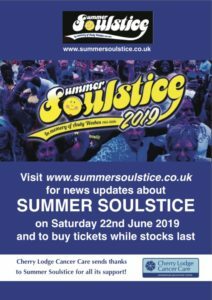 All events are currently advertised by flyers, on the website, on Facebook, in our newsletters and in e-mails to members, with banners at events. 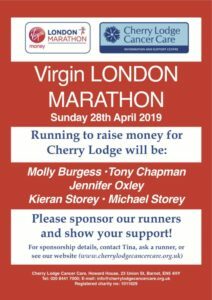 We will continue to take all opportunities to promote the services that Cherry Lodge provides and to make members and others aware of events. We remain open to all offers of help from members, whether it be with fundraising, supporting events or volunteering. However, we would also wish to ensure that members do not feel under pressure to offer to help. Our fundamental aim is to continue to provide our well-established services to members both within our centre at Howard House, 23 Union Street, Barnet and also increasingly as outreach services and in people’s homes. We envisage that future expansion will fit a Hub and Spoke Model, with Howard House as the hub, our Centre, our main staff base and from which both staff and volunteers outreach. We see the development of our outreach services as a key strategic development for our future as a way of meeting the needs of a larger number of people across the Borough of Barnet and South Hertfordshire and also helping some of the harder to reach groups. This will also alleviate pressure on space within Howard House and address some of the transport difficulties members face in attending our Centre in Union Street. It also enables us to work with and develop our networks and partnerships with other community groups. Cherry Lodge Cancer Care Ltd is a charitable company limited by guarantee (registered charity number 1011629; company registration number 2700192). Our current financial position is strong and we are confident that we will be able to meet our financial commitments for the foreseeable future. In 2015, our total expenditure was £447,000, comprising costs for providing our cancer information and support services (£223,000), costs relating to the generating of funds through fundraising and our two shops (£212,000), and governance costs £12,000). This picture is typical of the past 4 years, following the opening of our Borehamwood charity shop in late 2011. Total expenditure in 2016 will be higher due to building work carried out at our Centre, Howard House. Our income is derived from a mix of funding streams (as outlined in the ‘Fundraising’ section of this document, below). In 2015, our total incoming resources amounted to £680,000, of which £290,000 came from legacies (virtually all from just one very large legacy). Income from all other sources produced only £390,000, which would have been insufficient to meet our running costs. Our reliance on legacy income to meet our running costs in 2015 is part of a broader picture. Without legacy income we would also have incurred small deficits in 2013 and 2014. It seems likely that this trend will continue in view of what appears to be a general reduction in income from other sources, notably from fundraising events and charity shops. Other charities have reported a similar pattern in recent years. Legacies, especially large ones, are rare and random events. Over the past seven years, three large legacies (£690,000 in 2009, £170,000 in 2011-12, and £280,000 in 2015) have transformed Cherry Lodge’s financial picture, enabling us to buy and upgrade Howard House and being largely responsible for the increase in our funds from £364,000 at the beginning of 2009 to £1,842,000 (including restricted funds) at the end of 2015. Reliance on legacies for day to day running costs has inherent risks due to the unpredictability of this type of income. For this reason our policy is to maintain a minimum of two years’ reserves. Our reserves currently exceed this target and we are looking into the best possible ways of reducing this excess in accordance with our mission to enhance and complement the support we offer, free of charge, to local people living with cancer. The need for a major Fundraising review was identified as a Key priority for 2015 and this review has now taken place. Our short-term strategy is to look at ways of increasing the spread of activities outside of the existing four streams in order to future-proof income. Currently events make up 50% of CL’s total income and within this 40% is from just two activities (Soulstice and Chairman’s Appeal). To minimise future risk, it has been agreed that we need to consider ways to ensure stability of income delivery through fundraising. It has been agreed that we will review the fundraising plan yearly to ensure that we can cover a majority of Cherry Lodge’s operating costs from profits. As a result of this review we will adapt our strategy to meet Cherry Lodge’s changing needs. We have put in place a financial fundraising review document, which will be reviewed monthly at Trustee meetings to ensure that we understand yearly income expectations from fundraising. The Charity has been managed by the Board of Trustees since 2006, before which there was a paid Chief Executive. The current model has worked well and clearly saves money for our charitable purposes. The Chairman (a founder of Cherry Lodge) currently plays a significant part-time role in the day-to-day running of the Charity. This is not a long-term sustainable arrangement and consideration will have to be given to future management support. 4 in our shops (2 full time and 2 part time). To comply with government legislation, since February 2016 all eligible staff have been enrolled into, or have opted out of, the Cherry Lodge Workplace Pension Scheme provided by Standard Life. In June 2016 there were 182 registered volunteers, who support and provide services in a range of settings and requiring a variety of skills. The trustees value the contribution made by all the Charity’s employees and volunteers and will ensure all are treated with fairness, dignity and respect. The trustees expect everyone to give of their best in delivering the Charity’s range of services and will support them through the provision of constructive feedback and appropriate opportunities for all employees and volunteers to learn and develop. To review management arrangements to ensure sustainability for Cherry Lodge and to allow the charity to continue to grow and respond to need. To ensure volunteers are supported, trained, valued and recognised.